Join Me for Tinker Tailor Artist Maker! Hi all! Just checking in to let you know about a new event I'm involved with... I'm incredibly excited to share that I'm an educator at Tinker Tailor Artist Maker - an Eat Cake Create retreat. I've had the pleasure of attending their Art is You retreats as a student on three occasions, so I know how wonderful their events are and I'm thrilled to join the family! I'll be teaching three new, never-before-taught workshops at this amazing new event in Redwood City, CA (just outside of San Francisco): 3D Boho Collage, Stenciled Mixed Media Medallions, and Mixed Media Floral Still Life. In addition to my classes, there's a fabulous lineup of over 50 studio sessions with some truly wonderful teachers. I hope you'll join us! Registration will be open to Gold Pass members on January 11th and to the general public on January 12th. You can also sign up to receive an email as soon as registration is open, and workshops are going to fill quickly, so you'll probably want to do that. You can head on over now to get all the details and start planning your classes. I'm super excited to announce that I'll be participating for the fourth time as an artist in Creative JumpStart (CJS) 2019, run for the 8th year by Nathalie Kalbach. 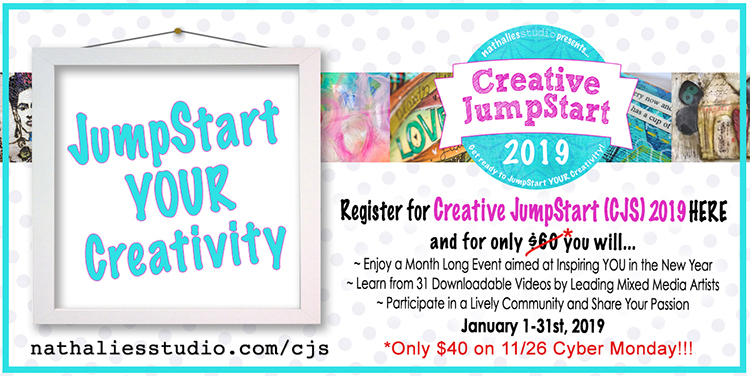 If you're not familiar with CJS, it's a one-of-a-kind online event to kick your creativity into high gear in January 2019. Interested? Head on over to Nathalie's site to sign up or to get more details. So what are you are waiting for? Sign up today! I hope to see you there! It's Black Friday, and you know what that means... sales! I've got a few deals to share if you're interested, starting with a sale + Black Friday coupon for my shop. I'm downsizing my store, so most of the items are already on sale from 10-50% off, and for this weekend only you can also save an additional 20% (plus it's 20% off the non-sale items like stencils, embossing powder, and sari scraps) when you use the coupon BlackCyber2018 at checkout. For all you stencil fans, here's a heads up that all of my stencils (and all stencils at StencilGirl) will be on sale starting Sunday, 11/25 through Tuesday 11/27 for 20-25% off - look for the details in the banner below and make sure to use the coupon codes! Finally, one more teaser... I'm an instructor in Art Walk Alchemy 2019 and there's going to be a little Cyber Monday sale for those of you who are interested in signing up... details coming Monday, but you can learn more about the course now. Looking for this project and tutorial? This post has now moved to my website! Gwen Lafleur <-- See the tutorial on my website! My post featuring this 3D Boho Fish shadowbox tutorial has moved! You can now find the entire article on my website. Hi all! I'm up today on StencilGirl Talk with my quarterly blog column focused on paint and texture. This month I've taken inspiration from the fall season and made a mixed media panel with a tree bark-esque textured background, and fall leaves made from acrylic skins. Of course, there's also a tutorial for both the background and the leaves, so make sure you head on over to check it out! It's that time again... when I make a new journal and assemble supplies so that I can document my next adventure while I'm on the road. This year I'm heading out on the trip of a lifetime (I feel like I've said that before... lol) as I start in China and follow along the Silk Road in the footsteps of Genghis Khan and Marco Polo. We'll be keeping mainly to the Northern trade route through Western China, starting in Xi'an and then traveling by private train through five of the seven "Stans." Of course, I'm going to need to document this year's trip of a lifetime. I've been making travel journals for ten years now, starting with my first trip to China in 2008. A decade later and things are coming full circle as I head back to China for the third time, only this time with a much different approach to my journaling. Below you can see the progression as I've continually refined the format and style of my journals over the years. Next I tried some small 3-ring binders for shorter family trips, then took the Scrapbooking on the Road online workshop with Ali Edwards before my Foreign Business Excursion that was a part of my MBA program back in 2011; I used that method to document that trip. I loved it - that book is still one of my favorites, but I've found that between the amount of writing I do, the volume of paper and ephemera I collect, and the length of my trips, that using those giant metal rings is not my favorite way to go. (Not to mention, carrying a hole punch with you will get you stopped at airport security every time. Guaranteed.) I nevertheless continued to use that method over the course of the next few trips (Peru and Southeast Asia are the other two you see above,) before I decided to try binding my own journal, which I did for Bali, China / Mongolia / Russia, and then India. I found that while I much preferred the format, having to pre-determine the number of pages was a huge challenge that I only got right on one out of three tries. That brings me to this year's journal. I decided to try a different approach that would still allow me to finish with a case-bound book, but which would give me more flexibility along the way so I wouldn't end up with way too many or too few pages. I decided to create a Midori-esque journal and make my own case and inserts... Boho style, of course! When I get home, I'll take the completed inserts out of the cover and bind them into a hardcover book. Then I can reuse this cover. I set it up so that there are only three inserts attached inside the book at any given time, but I made four more so that I can swap them out as I fill them and also keep the book from becoming too unwieldy as the trip progresses. Of course, that brings up the question that I get the most when it comes to creating a travel journal... what do I take with me? I used to take a lot - alphabet stamps, ink pads, letter stickers... all kinds of stuff. The problem ends up being the obvious one of space and weight in your luggage (and when you travel by airplane in China, your checked bag has to be under 44lbs and your carry-on should be under 11lbs, so that's not really feasible!) The other issue with hauling all that stuff is that your journaling just takes a lot more time and space to accomplish. So while the format of the book is still evolving, I think I've perfected the travel journal kit itself - at least for the way I like to journal. The bottom section of the case holds my colored pencils, water pens for watercolor, and drawing pencils. The little pocket has a few embellishments - a few rubons and a popsicle stick (again - nothing sharp,) some little pockets and envelopes that I can add in to hold various ephemera, and then my pre-made labels. I started doing this quite a few years ago and it's really the main thing that lets me cut out so many supplies but still make the pages look a little more designed. When I get my itinerary, I go through and stamp labels for the countries, cities, and major landmarks or places of interest that we'll be visiting. Then I tuck in a few blank labels if anything gets added along the way. For my travel watercolor set, I cut a regular manila file folder in half, then cut about an inch off of various sheets of Peerless watercolors (which are watercolors that are actually dried on paper instead of in a pan - ideal for travel!) and adhered them into the folder and labeled them. I keep a sheet of deli paper inside to keep them from touching each other when the folder is closed. The slick surface also works great as a palette when I'm using them. I just bring a few water pens with different sized brush tips, and I'm good to go! That's it for the pre-trip work... now that my journal and supplies are all put together and ready to go, I'm excited to get on that plane and let the adventure begin! Lynda Shoup from the Artist Tribe has a fun new project today that's going to make you want to run right out and make your own stenciled boho phone clutch! Lynda used my Art Deco Borders stencil to create the pattern on the front of the clutch... make sure you head on over to her blog for more photos and details! I'm excited about today's Artist Tribe project from Jill McDowell... she's combined two of my favorite things in this fabulous mixed media piece - rust and embroidery! Here you can see where she's used my Decorative Folk Flower stencil as an embroidery pattern, along with a lot of other fabulous elements! Make sure to head over to Jill's blog so you can see the entire piece and read about all the details!